Who doesn't love a good starburst mirror? Now, I am both very cheap and very impatient, so clearly neither of these options was going to work. Enter option three....try and make one myself!!! 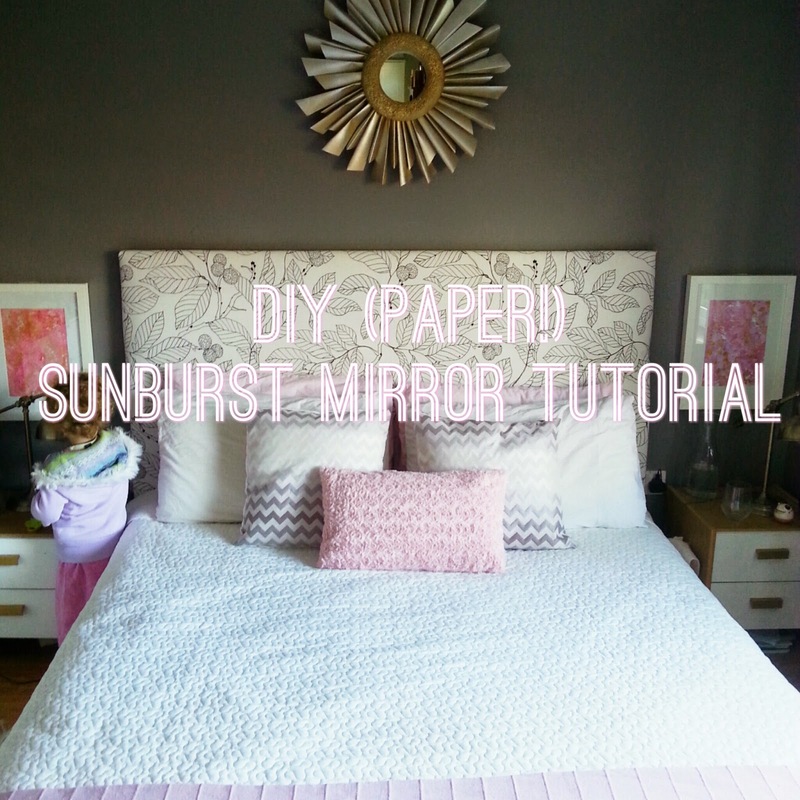 So I typed "diy sunbirst mirror" into pinterest and quickly realised that you could make one out of paper, woohoo!! So that's what I did. First, I decided on the style of mirror that I wanted, and from my research on pinterest it was clear that I favored the ones with angled edges. 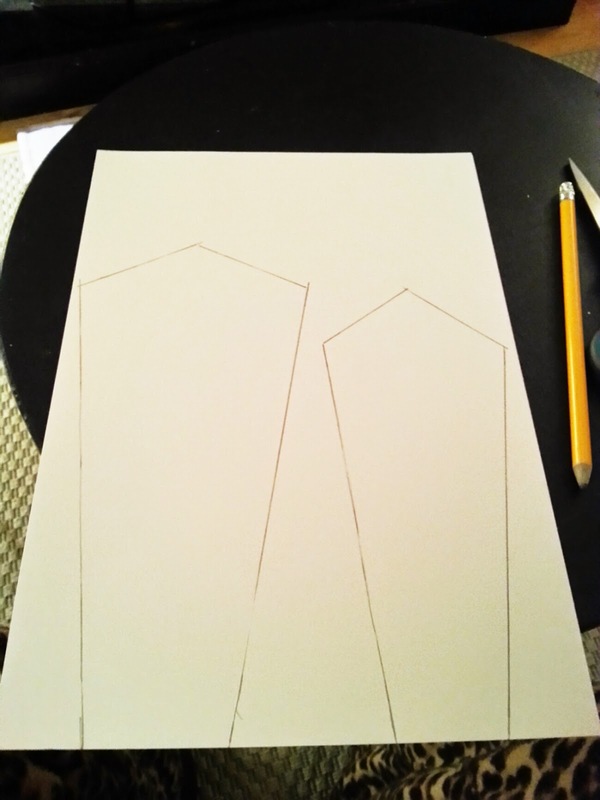 So my first step was to draw out templates for a longer and a shorter piece. The longer was 8 inches long, and the shorter 6. 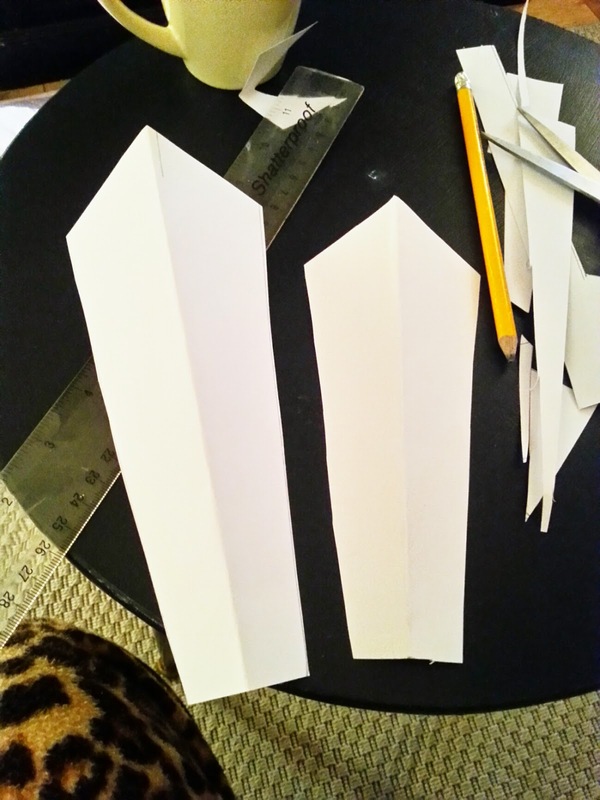 I cut these out, and then used them to cut approximately 20 of each from white card. 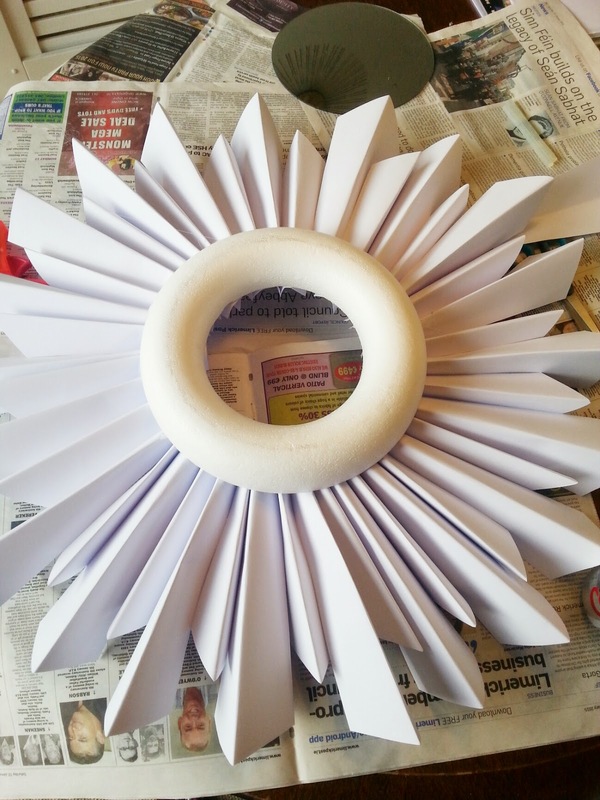 Once they were all cut out I folded them down the center so that they would have a 3D effect on my mirror. 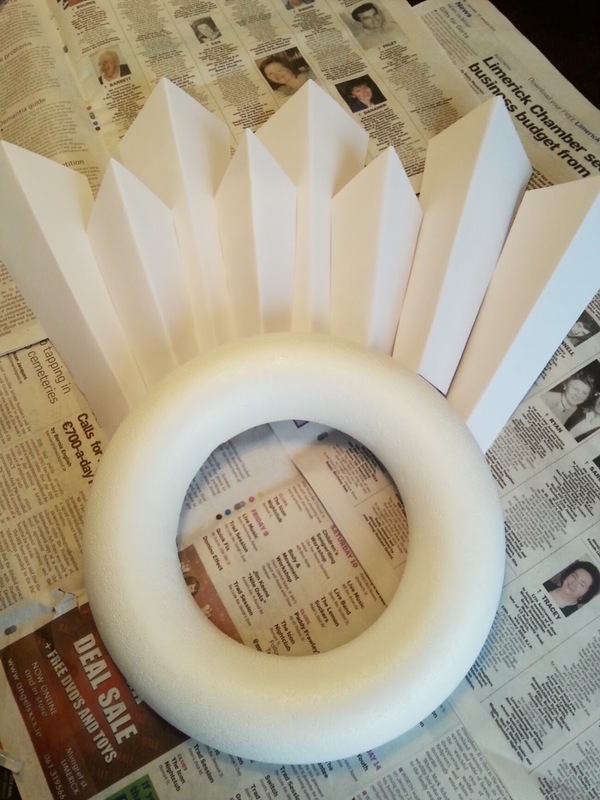 I then laid the out in a circle and added a styrofoam ring (bought in a craft shop for a couple of euro) on top to get an idea of the spacing and what looked best. Then it was out with the trusty hot glue gun to attach them all to the back of the ring. A dab on the folded point of each piece did the job. 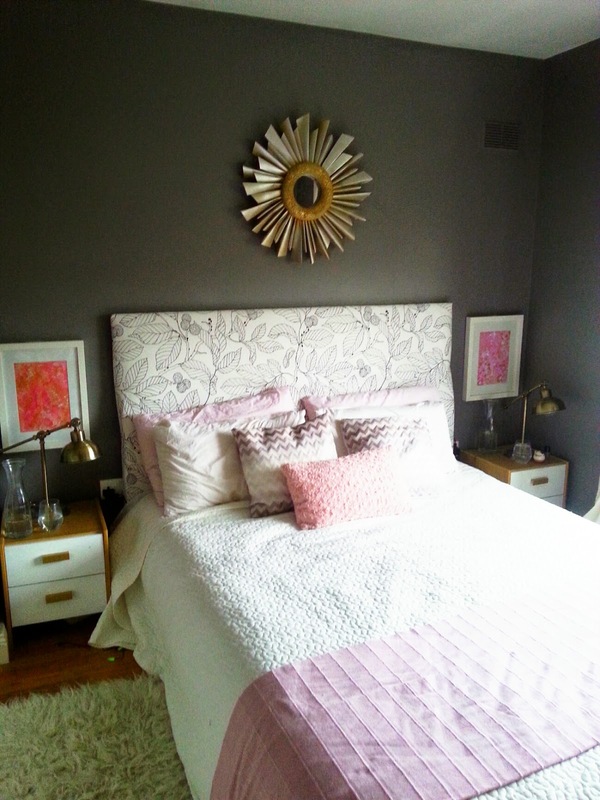 I then spray painted this with Rustoleum gold (the regular kind, not the "bright metallic" I usually use as they were out of it when I went o buy it...but I think the duller, less brassy gold actually works better in this room, lucky!). This is where I must admit I made a big mistake....apparently styrofoam really doesn't like spraypaint....as in, it melts on contact with it! So I was left with a kind of weird looking, melty surround for my mirror, but I decided it had character!...and also, I was not willing to go back and re-do the whole thing at that point. So I stuck my mirror (bought on ebay, but you can get them in B&Q) to the back of that sucker, glued sone string to the back so it could be hung off a command strip hook over the bed, and called it a day. I must admit I love it, I think it really finishes off that wall, and works really well with the grey. Anyone else made something interesting out of paper? 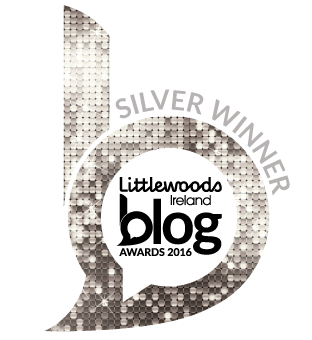 This is why blogging is so good, or at least it would have been if I had found you before this. 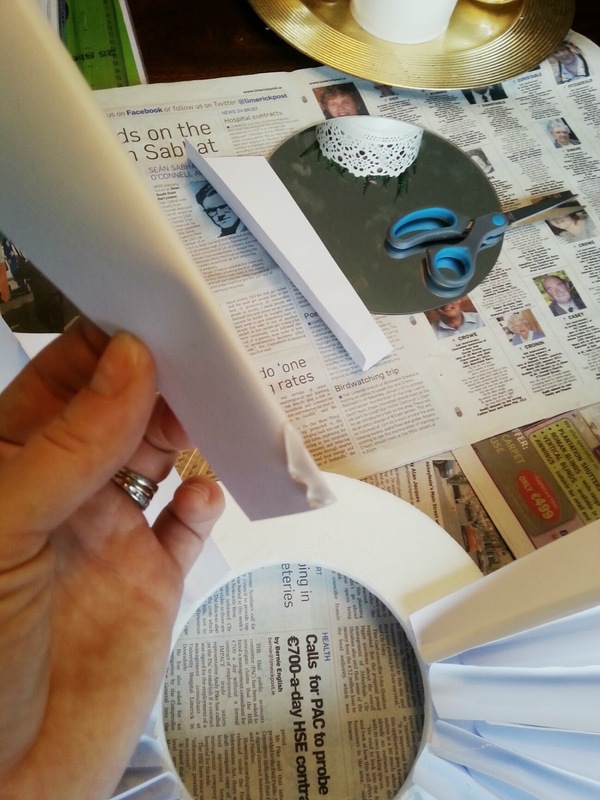 Spray paint is the enemy of styrofoam! Been there, done that. 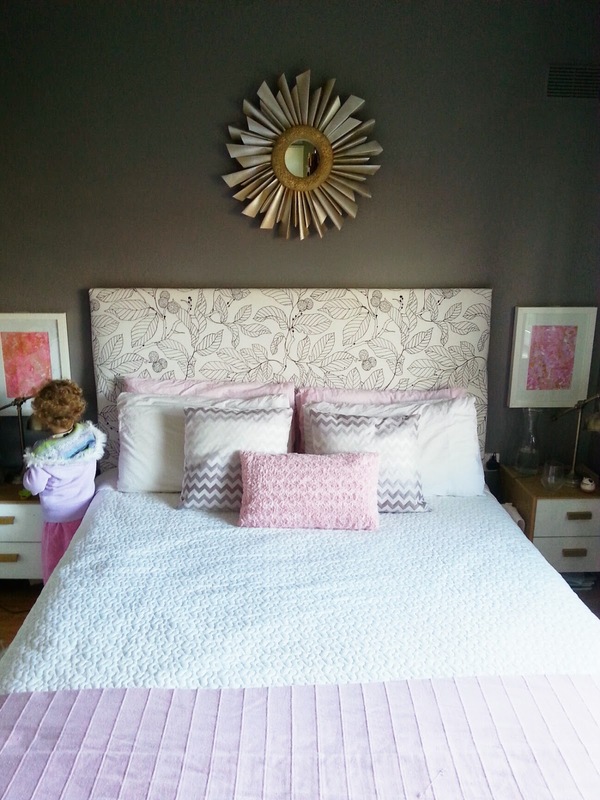 I still think it looks really pretty, I have always loved these mirrors and longed after a super expensive Laura Ashley version for a while. I, too love sunburst mirrors! I haven't seen this version. I didn't even notice the Styrofoam issue but I suppose you would in real life. I would take some drywall spackle (nail hole filler) and smooth it around the foam ring and re-spray paint. I guess you would either have to remove the mirror or tape it off, what a pain. Anyway, I like the mirror! What have I made out of paper? I took an old book, painted the edges of the pages black and fanned it out to dry. Then I ripped the pages out and rolled them into little tubes and made a wreath with them, two layers. It would have been a sunburst mirror if I had added a mirror but I didn't have one on hand so I just left it. It was so awesome and then after a couple weeks, it drooped and warped on the wall and wasn't flat anymore. I haven't figured out how to fix it yet. That sounds lovely, it would be a really great gift for someone if you used a copy if their favorite book, I may have to try that! As for the drooping, would it have something to do with where it's placed? I had to replace a few "sunbursts" on my mirror cos where I left it to dry was a bit damp and made them droop, but now that it's hung in my dry bedroom I haven't had any issues with it. I mounted it on cardboard and I guess maybe the layers of glue weren't all the way dry so it drooped. I need to reinforce it with something firmer, but I hate cutting out circles in wood so I haven't done it. Maybe I can just use some shims or something and cut them into a hexagon.